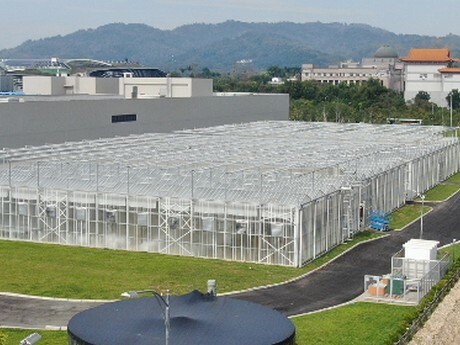 Bosman Van Zaal is currently adding the finishing touches at the turnkey research facility for CH Biotech in Nantou, Taiwan. CH Biotech develops and innovates agrochemical products to meet the challenges of climate change and a growing world population. In collaboration with the Westlandse Project Combinatie BV (part of VEK Adviesgroep) Bosman Van Zaal is realising a centre for CH Biotech where plant genes and environmentally friendly, active ingredients (AI) are arranged. The result are products such as plant growth regulators, growth-promoting agents and powerful fertilisers that are more efficient and effective. This project was accepted at the end of February 2017 and the company started building two Venlo greenhouses, made of metal, aluminium and glass. The construction is painted white and the glazing is special, so that there is an optimal flow and distribution of light. Moreover, the greenhouses are earthquake resistant. The greenhouse is equipped with own water, electricity, climate and cultivation systems, including ebb and flow containers, silos, fog systems, pad & fan and drip irrigation, LED lighting, vapour and UV resistant insulation, electric heaters and double ventilation air coolers. In addition, a Hoogendoorn climate computer is installed to have complete control and insight into the crop conditions.